Ibn-Racin was the name of the Berber tribe that established here with the Muslim invasion. After some time it became a Roman town. The town was called Santa María de Oriente when it was Christian…The ancient history of Albarracín begins like this, a history where protection and defense have been the premise. Today, as you walk its narrow streets and breathe the calmness, it is difficult to imagine that its location was not imagined just for pleasure but as a shelter against danger. The amazing old part of town is just for pedestrians and very high up. If you go up on the afternoon you will see that the passageways under the arches, the stairs, the doors of the mansions, seem as if they were inhabited by mysterious shadows. Albarracín oozes an aristocratic air; you can see it in its studded doors, in the iron door knockers, in its balconies made with carved wood, in its spectacular work with wrought iron. In one of the winding streets there are little squares that open over the abysm from where the houses seem to hang. The landscape is extremely beautiful. For the construction of houses, they have traditionally used plaster instead of stone, and the color of its walls has the same color of the ravines underneath them. But even if you have heard a lot about it, it still impacts you on your arrival. You can get to Albarracín through the same road but with two different visions. One, when you arrive from Teruel, with the A512, and after a curve you suddenly find yourself on its lower part. Then, the town gives you the incredible image of a city, with infinite tones of orange and pink, embedded in the rocks, and you can’t stop looking at it. Known as “the most beautiful town in Spain”, Albarracín is located 30 minutes away from Teruel. 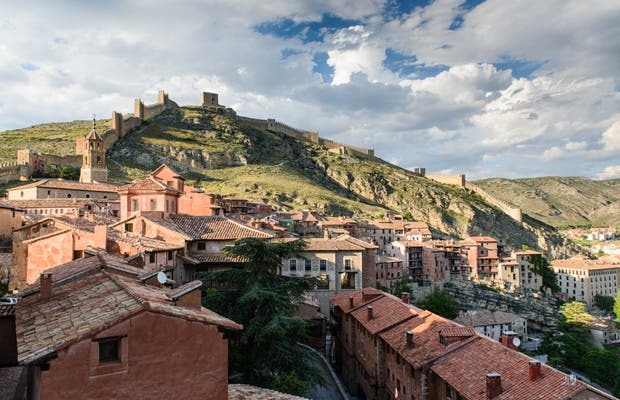 Located southeast of the lower part of Aragón, the town of Albarracín owes its name to the Muslim conquerors Aben Razin, the name of an Arab family. To walk its streets is to really go back in time all the way to the Middle Ages.